The tense 2016 American presidential election is coming to a close, and the time has finally come for you the voter's voice to be heard. As you queue up at your local polling place, make sure you come prepared with an Election Day playlist that will get you pumped to vote. The lines may be especially long this year, but simply pop in your headphones and allow this music to lift your spirits and carry you through. Let the feelings of elation, pride, (and relief) wash over you as you wait to do your democratic duty. I always love the sense of anticipation and solemnity I feel waiting in line to cast my ballot — but this election is special. Today, America makes a monumental decision. For the first time in history, a woman is on the presidential ballot as a major party nominee, and nobody should sit out on this historic day (or herstoric moment, if you prefer. I'm not going to lie: I'm pretty emotional right now.) The lines are longest in the morning and evening — before and after work— so be prepared to wait a little while to cast your ballot in this tight race. Who knows? If enough people get out and vote there soon may be a bad*ss Nasty Woman in the White House. So put in your earphones, and crank up these very tunes to celebrate democracy in action! Start your wait with HRC's campaign song and girl power anthem. This song will help you feel the importance of this truly special moment as you get ready to step into the booth. 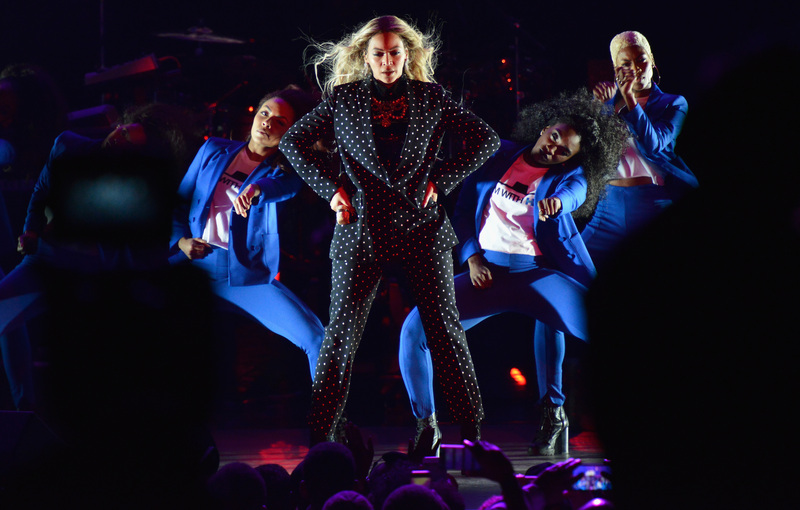 Let's hope Queen Bey's flawless feminist anthem is right about this election! Lighten things up by listening to Rachel Bloom explain why every vote counts in this humorous song with help from all your fave celebrity pals. This song went right over my head when I watched Mary Poppins as a child, but it seems to be particularly applicable today. The lyrics hold a mix of humor and truth that will make you think back on of all the women who fought so very hard to made what we are doing today possible. Let's keep the showtunes blasting with this classic fight song. When anxiety about the fate of this country is running high, sometimes the only thing that can make me feel better is some good old fashioned Broadway belting. This song has some remarkable parallels to what our country is going through and is perfect for keeping that revolutionary energy up. Warning: All the harmonies may make you a wee bit emotional. Keep the emotions flowing with one of the best politically-charged anthems ever written. This crowdpleaser has killed at Clinton's rallies, and will continue to keep you pumped as you wait in line. Katy Perry has been a huge supporter of Clinton since the beginning of her campaign, and this song never fails to lift spirits. Queen Latifah's powerful song reminds women of the importance of standing up for yourself. After months of a dark election cycle, this country finally gets to use its voice. Get ready to speak your mind on the ballot with this uplifting number! Take a lesson from Alexander Hamilton, and don't throw away your shot to make a difference in this very important election! This Salt 'n Pepa song debuted the first year Bill Clinton was in office, and it continues to be one of the best songs about independence out there. This timeless song from 1965 makes a feminist statement that can't be ignored. Keep the female energy flowing as we prepare for the ultimate glass ceiling to hopefully be shattered. We're all in Suffragette City today! This line has been pretty intense, so why don't we take a moment and chill things out with a little inspirational reggae? Now the time has come for you to finally do your civic duty! Remember, you have the power!